JAKE Stewart has one hand on the Cuestars South Wilts Snooker League trophy. The “formidable” front-runner secured a 5-0 whitewash over Stuart Dreyer with breaks of 71, 60 and 55 at Salisbury Snooker Club. Dreyer said: “Jake is a fantastic cueist and he times the ball so well. 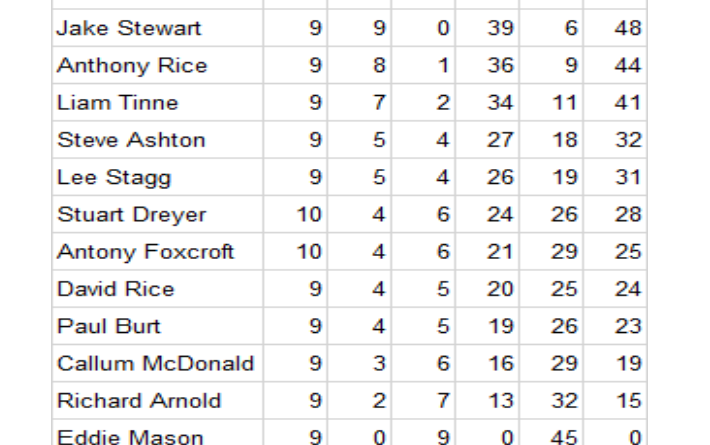 Stewart has a four-point advantage over Anthony Rice with two rounds of matches remaining. Rice wrapped up a near two-and-a-half-hour 3-2 victory over third-placed Liam Tinne with a run of 62. Tinne, who had gone in-off on a break of 31 while splitting the pack from the blue in the decider, laid a couple of good snookers but his opponent from Fordingbridge successfully plotted escape routes. Rice said: “I enjoyed the match and was pleased with the win. David Rice cleared the six colours from 18 points behind to “pinch” the first frame of a 3-2 win against Paul Burt, who posted a 44 in the fifth. And Antony Foxcroft went down 4-1 to Lee Stagg. “Lee was more clinical when it mattered and deserved to win the match,” he conceded. Graham Wallace has been forced to pull out of the league and all of his results have been deleted. Results: David Rice 3-2 Paul Burt, Liam Tinne 2-3 Anthony Rice, Antony Foxcroft 1-4 Lee Stagg, Jake Stewart 5-0 Stuart Dreyer, Richard Arnold P-P Callum McDonald.